Sometimes you have to pay tribute to the classics. And mashed potatoes hold a special place in my heart. As kids, my brother and I would battle it out in epic mashed potato volcano competitions. We would race to build the most perfectly sculpted mashed potato volcanoes. To the winner went bragging rights and spoils – or in our case, copious amounts of gravy. The trick was to do a good job building your volcano, otherwise you might get early leaks in the sides or bottom. So not cool. I'm smiling as I write this – does that give away the fact I’m still a kid at heart? 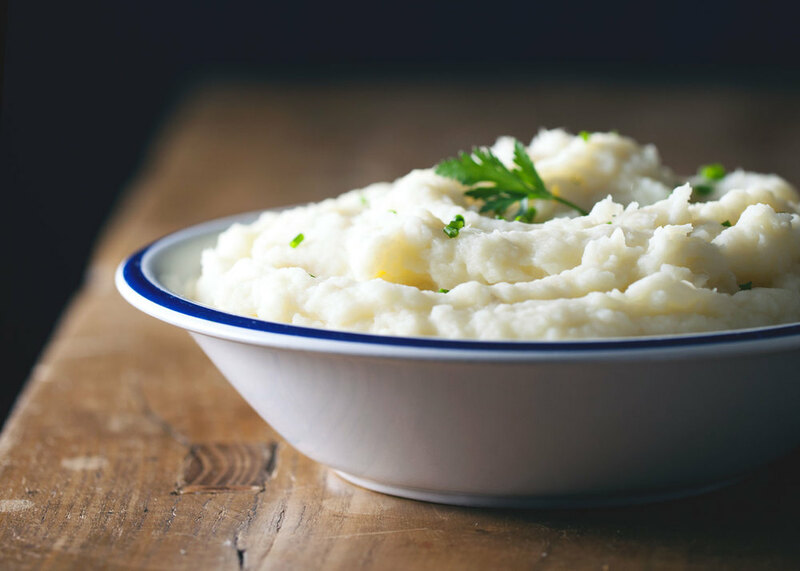 With the cold weather and heavy rainfall leaving us chilled to the bone these past couple weeks– it seemed like no better time to whip up a batch (or three) of mashed potatoes. We had friends over for dinner last week, so I gave this recipe a try for the first time. My volcano building skills have deteriorated over time, so I decided it was safest to hold the gravy. And, replaced it with a ton of vegetables and a flavorful sauce instead. Healthy decisions for the win. These are not your traditional mashed potatoes. I wanted to put my own spin on this classic by using a combination of parsnips and potatoes. The parsnips add a slightly sweeter, earthy note to the dish. It tastes bright, fresh and autumnal (it’s a legit word, I swear). And, while I love roasted garlic in mashed potatoes, I definitely don’t love how much time it adds to the cooking process. I found that by tossing whole cloves of garlic into the steamer basket with the parsnips and potatoes, I was able to quickly replicate some of the flavor you get from roasted garlic. It also helps soften them for mashing, so it combines smoothly with the parsnip and potatoes. This is a perfect shortcut for infusing some mild garlic flavor into your mash! And, in case you were at all worried, I made this recipe one you could feel good about eating on a weekday. So, you'll see it has just enough butter and milk to whip up into a smooth mash, but not so much that you feel like you've gone through Thanksgiving round 2. You're welcome. Now, it's what goes on top of the potatoes that really gets me excited. The braised eggplant cooks down to velvety soft bites. It provides the satisfaction of a warm comforting dish – and in our experience, is appealing to others who are used to eating their potatoes with meat. Since we haven't yet delved into the depths of winter, I tried to strike that ever elusive balance between comfort-food and food-coma-inducing-food. The lighter, Mediterranean-inspired flavors help. That means tons of fragrant spices and herbs – things like coriander, cumin, lemon and fresh thyme. In addition to eggplant, there's also a good serving of tomatoes, kale and cannellini beans. Everything cooks down in a broth of white wine and vegetable stock to create a silky sauce that you can ladle over top of your potatoes. Think of it as a more sophisticated, weeknight-appropriate form of gravy. Yum. If you've taken a peek at the list of ingredients, you may have noticed the list is a bit longer than usual. But it isn't nearly as bad as it looks. Most of these ingredients are fairly standard spices you'll already have in your pantry. And the small add-ins, like olive oil, lemon juice and honey (or sugar) are all very minor (but important) things that create a well-balanced sauce. I ended up tweaking the proportions a few times to get the salt, acid and sweetness to marry just right, and this is our favorite version! 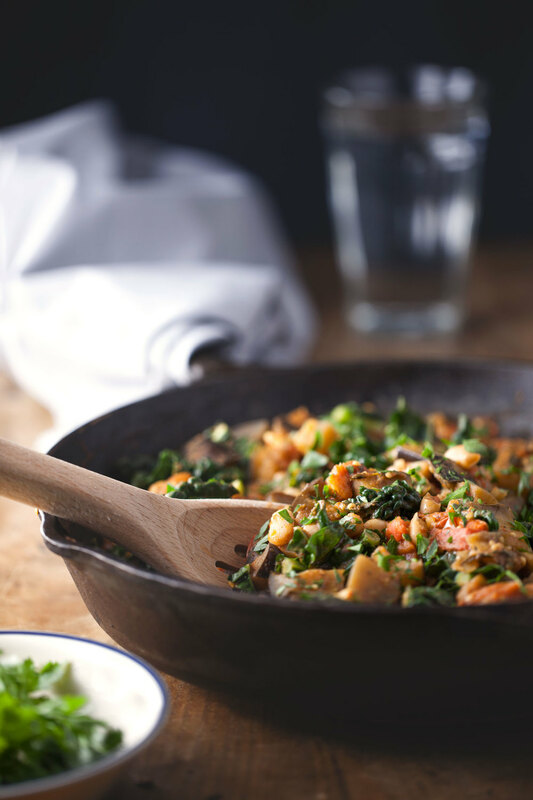 So, next time you're feeling like a cozy bowl of comforting mash and veggies, give this recipe a shot. It's our new go-to when cooking for non-vegetarian friends and family. Slice the ends off the eggplant. Slice into ~½" cubes. Heat neutral oil in a saute pan over medium-high heat. Once warm, add diced red onion and cook for 2-3 minutes, until softened. Add minced garlic and cook for another 1-2 minutes. Stir regularly and reduce heat at any point if garlic starts to burn. Add cubed eggplant, coriander, cumin and paprika. Stir well to ensure the spices are evenly distributed. Saute for 7-10 minutes until the eggplant is tender. Pour in white wine to de-glaze the pan. Once most of the wine has evaporated, add the vegetable stock and bay leaves. Reduce heat to a simmer. Add the beans, tomatoes, kale and thyme and cook for another 5 minutes. Stir in lemon juice, olive oil, honey and salt (to taste). Remove bay leaves. Serve. Top with parsley if desired. -*I use non-dairy milk (unsweetened, unflavored), but regular milk works as well. 1/4 cup of milk is suggested, but add more if necessary. -**Depending on the eggplant, its skin might be softer or thicker. I find that larger / older eggplants tend to have tougher skin, and some people find it bitter. In these instances (especially when I'm serving to guests), I'll usually peel the eggplant to be safe. But, if you know you like eggplant with the skin in, by all means keep it. -***Cocktail tomatoes are slightly larger than cherry tomatoes (think golf ball sized). You can substitute cherry tomatoes if you can't find the cocktail variety. In this case, since smaller, you may wish to keep whole. -****This helps to balance out the acidity in the tomatoes. Can be substituted for sugar. Feel free to omit if preferred. In a large pot fitted with a steamer basket, fill water until the water level is ~1/2" below the bottom of the steamer. Bring water to a boil. While the water heats, dice parsnips and potatoes into cubes. Once the water is boiling, add parsnips, potatoes and whole garlic cloves to the steamer basket. Cover with a lid and steam until parsnips and potatoes can be easily pricked with a fork. Depending on the size of the cubes, this should take 10-15 minutes. Once cooked, turn off heat and keep covered while you prepare the rest of your dish. Just when you're about to serve, strain the parsnip, potatoes and garlic. Shake well to remove excess liquid. Return to the pot and mash with a potato masher. The garlic will be soft and should mash in with the parsnips and potatoes very easily. Add milk, butter and salt. Serve with Mediterranean Braised Eggplant.